Using a bottom-dwelling, soft-bodied gastropod mollusk might at first seem the most unusual way for Mother Nature to express her most hallucinogenic ideas of majestic color. But these shell-less snails bear some of the most fascinating complexions and intricate patterns of any animal on Earth. Hypselodoris midatlantica. On a favourite reef, 30m deep in Tarifa. Coming across them so often as we do here while scuba diving on the southern Spanish coast of the Costa del Sol, you would be forgiven if you thought someone had spiked your scuba tank. Their correct name – nudibranch – is a dive van ice-breaker in itself. Pronounced nudie-brank, there’s always a surprised look on the diver being told about these fascinating creatures for the first time. 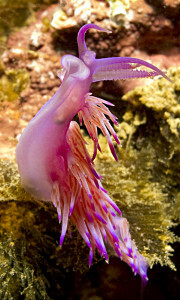 Nudi comes from the Latin “nudus”, or naked, and branch from the Greek “branchia”, or gills. Not so strange when you learn that their secondary gills protrude from their backs like small, feathery flowers. There are more than 3,000 known species of nudibranch, with new ones being identified on an almost daily basis. They are found throughout the world’s oceans, but are most abundant in shallow, tropical and temperate waters. 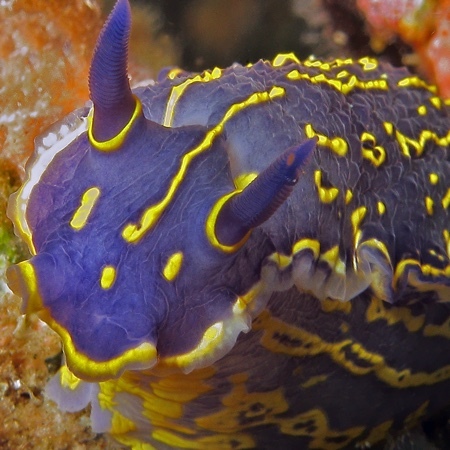 The Costa del Sol, Costa Tropical and Costa de la Luz – hunting ground of your humble narrator and Simply Diving’s hundreds of scuba divers each year – are home to around 85 species, from the blue and yellow Elegant Sea Slug, to the bright pink Flabellina. 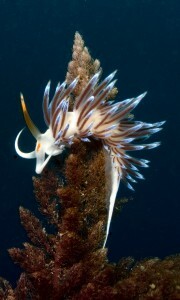 A Flabellina ischitana strikes a pose on a reef in Marina del Este. Some are much more rare than others and only the most eagle-eyed of scuba divers would spot the Dendrodoris limbata with its yellow body and speckled khaki camouflage. But it’s not just their exotic names and enchanting polychromatic disguises that have gained them such attention from the worldwide diving community, many of whom call themselves “nudibranoraks” or “nudinerds”. Some nudibranchs are solar-powered, storing algae in their outer tissues and living off the sugars produced by the algae’s photosynthesis. Generally oblong in shape, they can be thick or flattened, long or short, ornately colored or drab to match their surroundings. They grow as small as 6 millimeters or as large as 31 centimeters long. They are carnivores that slowly ply their range grazing on algae, sponges, anemones, corals and barnacles. And even other nudibranchs! A Migrating Aeolid munches its way over a tasty sponge. To identify prey, they have two highly sensitive tentacles, called rhinophores, located on top of their heads. Nudibranchs derive their coloring from the food they eat, which helps in camouflage, and some even retain the foul-tasting poisons of their prey and secrete them as a defense against predators. 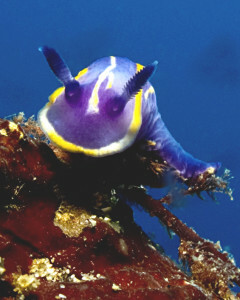 Nudibranchs are simultaneous hermaphrodites, and can mate with any other mature member of their species. Their lifespan varies widely, with some living less than a month, and others living up to one year. So whether you’re a self-confessed nudibranorak or a diver just wanting to add some psychedelic inspiration to your underwater explorations, a bit of nudibranch spotting while scuba diving in Spain will provide more than a mere logbook highlight. It could even leave you feeling high. For more photos of our local nudibranchs, take a look at our busy Facebook page. Or even better, join us on a dive trip!